Today, Swaziland – a small African nation almost never in the headlines – has announced it will be selling its stockpiles of white rhinoceros horn in an effort to gain needed and scarce revenue for protecting its small remaining rhinoceros population. South Africa itself has refused to accept this proposal, arguing that rhinoceros populations would be placed at even greater risk if horn could be legally traded. The Swazi government has also announced that it will be trying to collect horn from illegally poached rhinoceroses in order to further aid its ability to pay for the conservation of its remaining animals – which as with all of Southern Africa are the major drawcard for tourism to provide foreign currency. 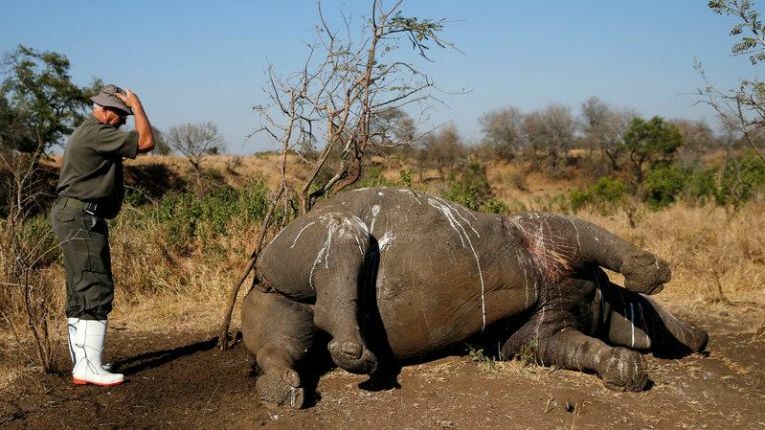 A dead rhinoceros in a game reserve in Swaziland. On the surface, removing rhinoceros horn stockpiles is a good idea – it reduces the incentive to bank upon extinction of rhinoceros species in the expectation that the now-strictly-nonrenewable resource of rhinoceros horn will increase so much in value that the speculators make large long-term gains. There is a major problem though – that it is probable that a public stockpile could if sold be transferred to one of the big speculators in rhinoceros horn. If this happened, it would not only give the speculators more power but also more reason to bank on rhinoceros extinction: their post-extinction profits would become greater than with extant stockpiles. For this reason, destruction of private rhinoceros horn stockpiles needs to be a critical goal: this, and only this, reduces the incentive to bank upon rhinoceros extinction.